A Dead Sea Scroll has lain undisturbed in a cave near Qumran for nearly two thousand years. 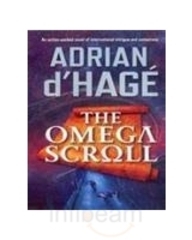 The Omega Scroll contains both a terrible warning for civilisation and the coded number the Vatican fears the most. The Pope's health is failing and the Cardinal Secretary of State, the ruthless Lorenzo Petroni, has the keys to St Peter within his grasp. Three things threaten to destroy him: Cardinal Giovanni Donnelli has started an investigation into the Vatican bank; journalist Tom Schweiker is looking into Petroni's past; and the brilliant Dr Angela Bassetti is piecing together fragments of the Omega Scroll. While they fight for their lives in a deadly race for the scroll, the Vatican will stop at nothing to keep the prophecy hidden. At the CIA's headquarters in Virginia, Mike McKinnon suspects a number of missing nuclear suitcase bombs are connected to the warning in the Omega Scroll. In the Judaen Desert a few more grains of sand trickle from the wall of a cave. The countdown for civilisation has begun.